As an Ohio employer, Bahrs Die and Stamping is committed to safety. We have partnered with the Ohio Bureau of Workers Compensation and their Division of Safety and Hygiene. The Ohio BWC’s Safety Intervention Grant Program helps hundreds of employers purchase equipment to improve safety in their workplace each year. Ohio employers experienced a 16.7-percent decrease in the rate of private-sector injuries in Ohio from calendar year 2010 through 2014. By comparison, the rest of the nation experienced an 8.6 percent drop in injuries during this same time. We wanted to help improve these numbers even more by strengthening our partnership with The Ohio BWC and doubling down on our commitment to protecting our own valuable workforce. Together we feel more confident that we can create a culture of safety in our own facility by preventing injuries and illness, and even saving lives. The skills we learned also will help us feel safer at home and even make ourselves more valuable to the communities in which we live. Our instructor stressed that all individuals have a need to know how to recognize and provide basic care for injuries and sudden illnesses. 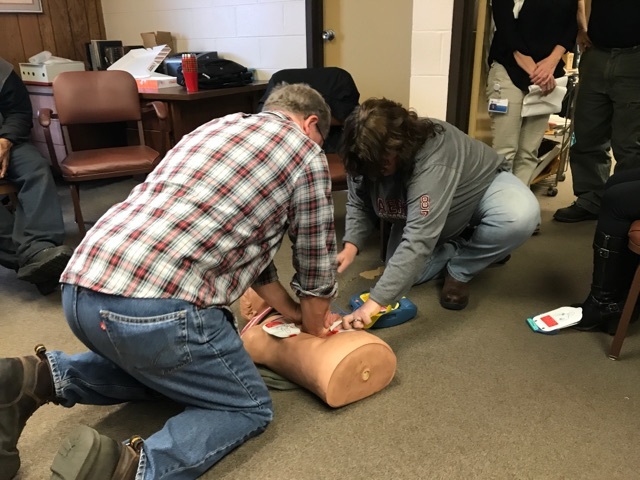 This included how to use an automated external defibrillator (AED) for victims of sudden cardiac arrest, until advanced medical personnel take over should attend. We all participated in actual exercises simulating a real life-threatening incident, and were taught the proper actions to take as first responders. This included the responsibility to instruct others of actions needing to be taken to ensure that professional help was summoned. Also to request and instruct bystanders as needed should we ourselves become fatigued. As students, we received an American Safety & Health Institute certification card after completion of the course. Basic treatments for other injuries. Provide first aid to an individual that is injured.